Chris Ephron hits a forehand. The junior helped lead Northwestern back to a .500 record. For many teams, starting off a season by losing their first four matches can signal the beginning of a down year. For Northwestern, that has been anything but true. After winning its match against Harvard (5-3) with a 4-3 score on Saturday and Purdue (4-2, 0-1 Big Ten) 5-2 on Sunday, the Wildcats (5-5, 1-0 Big Ten) are now victorious in five of their last six contests, with the only loss coming against Oklahoma State (5-3) 4-2 on Thursday. In all five of those wins, NU won the doubles point, putting them ahead 1-0 heading into singles play. 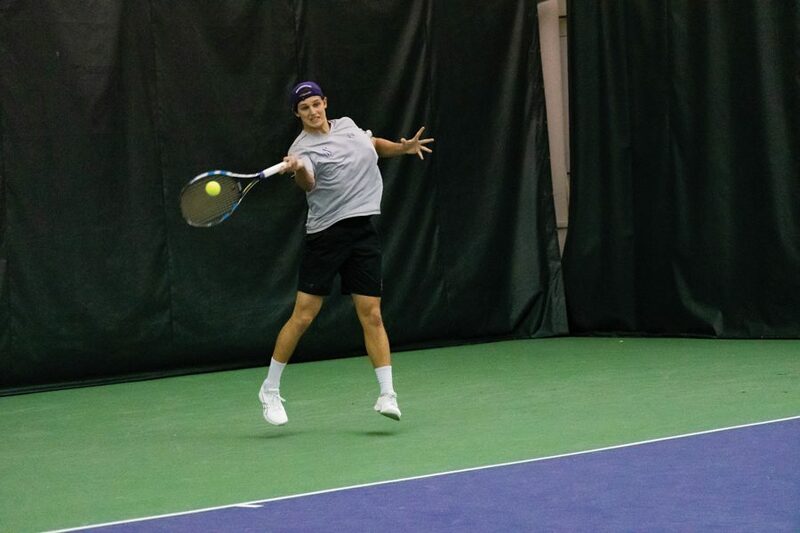 They have also been more successful recently in singles, winning three of five against the Crimson and four of five against the Boilermakers. Head coach Arvid Swan said the biggest reason for the team’s improvement in doubles play is returning. Junior Dominik Stary had the reverse outcome, losing his single sets 7-6, 6-4 but winning his doubles set with junior Chris Ephron, 6-4. Despite the loss in singles, Stary had won his previous three singles matches. Swan said this can be attributed to Stary’s attitude, effort and focus. Freshman Simen Bratholm has also been a major component of the team’s recent success. He won his singles match against Harvard 6-3, 6-2 and against Purdue 6-1, 7-6. After having the chance to adjust to collegiate tennis, Bratholm said he’s been “playing a bit more stable” with his shots. He said he also hasn’t been making unforced errors like he had been earlier this year. When looking at how well the team fared in the past week of matches, Pickens said he and his teammates were motivated to turn the season around. Overall, Swan said the improvement he has seen from the entire group is representative of his team’s character. He acknowledged that they are not worried about their record, but instead on continually improving.